What does Gryphon mean, details, origin, short & easy attributes? Gryphon pronunciation in 20 different native languages. 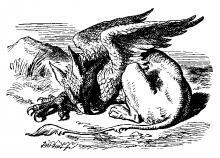 The name Gryphon is a Welsh baby name. In Welsh the meaning of the name Gryphon is: Fighting chief; fierce. The fierce Gryphon of Greek mythology and medieval legend was a creature with foreparts of an eagle and hindquarters of a lion. Gryphon is baby boy name mainly popular in Christian religion and its main origin is . Gryphon name meanings is Red, ruddy, prince. Other similar sounding names can be Griffin. Popular personalities with Gryphon Name. Other Personalities with Gryphon Name.